We believe in alota fun and or goal is to make it happen 7 days a week here at Nic's Bar & Grill on the East side of Green Bay! We are Packer fans...but love to have the fans around the NFL visit us! It's been such a super cold week that I needed to warm up with a nice beer. Driving down Main street in rush hour traffic (ha, please, Green Bay has ZERO traffic, I love it! ), I found my destination. I called up one of my good friends to meet me at Nic's Bar and Grill. It was Tuesday about 5-ish so the place wasn't crowded but there were more than a few people sitting at the bar. Actually, I was the only female in there besides the bartender, so single ladies this is your friendly announcement: booze and (older) boys at Nic's Bar and Grill. Be there. Nic's Bar is in a rectangular shape and when you walk in the bar is directly in front of you with plenty of stools around the perimeter. On the right side there are some pool tables, which I should tell you; on Tuesday's Nic's has free pool. I also noticed their special for Sundays was a pitcher of beer, like Bud Light, and a burger for $5. That sounds cheaper than cheap to me. If you want to know all the specials they have going on during the week I would give them a call. I'm sure they would be more than happy to tell you about them. Some of the beers they carry in bottles are New Glarus, Woodchuck, Dos Equis, Guinness and the usual domestics of Bud, Miller and Coors Products. I also saw baby bottles of wine in a cooler. You know, those airplane type wine ones, and although I am not a fan of ordering wine at a dive bar, at least you know what brand you're getting instead of their "house" variety. I only saw Sutter Home, so if you're a fan of it, you're in luck! And, of course, Nic's Bar carries every type of liquor imaginable to wet your whistle too. I think you'll have no problem picking your poison. 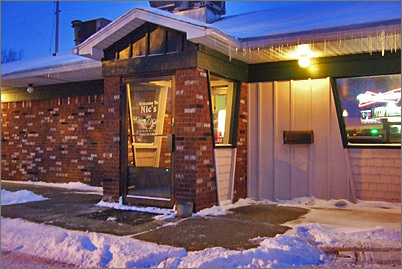 All in all, Nic's is a very low key, down to earth dive bar with cheap drinks. They open daily at 3PM.